""Communication with your customer is the key to any successful loyalty program and GSP has been instrumental in providing a clear and impactful message to our customers."" Flash Foods, Inc., based in Waycross, Georgia, operates over 170 convenience stores in Georgia and Florida. 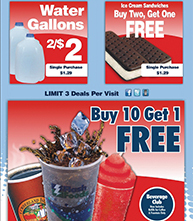 Flash Foods challenged GSP to develop a new POP campaign for their loyalty card program that would entice more customers to sign up, and also entice existing cardholders to use the card more frequently for gas and store purchases. The loyalty cards not only provide customer incentives, they are also advantageous to Flash Foods since the stores don’t have to pay credit card processing fees on their own loyalty cards. 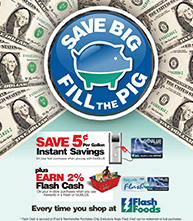 GSP’s new creative campaign “Save Big Fill the Pig” created a buzz and generated new interest in the GOBlue card. The customer saves money and earns rewards every time they use it, creating a more loyal customer for Flash Foods. The stores end up with more traffic and sales, and less credit card fees. Win win for both the store customers and Flash Foods.